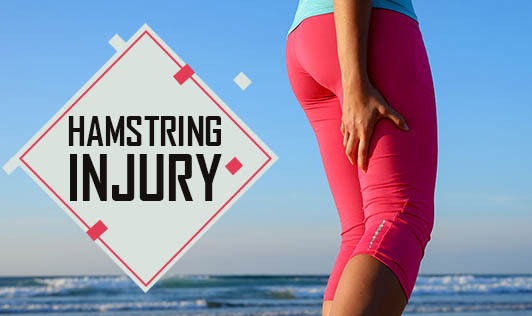 A hamstring injury occurs when you strain or pull one of your hamstring muscles- the group of muscles that run along the back of your thigh that allow you to bend your leg at the knee. During a hamstring strain, one or more of these muscles get stretched too far and sometimes the muscles might even start to tear. A person is more likely to get a hamstring strain during exercise that involves a lot of running, jumping or sudden stopping and starting. • Ice your leg to reduce the pain and swelling for about 20-30 minutes every three to four hours until the pain is gone. • Rest the leg and avoid putting weight on the leg. • Use an elastic bandage around the leg to keep down swelling. • Elevate your leg by using a pillow whenever you're sitting or lying down. Contact your doctor if you can't bear any weight on your injured leg and if you're unable to walk!